Data is from the October 2018 PwC "Holiday Outlook 2018." 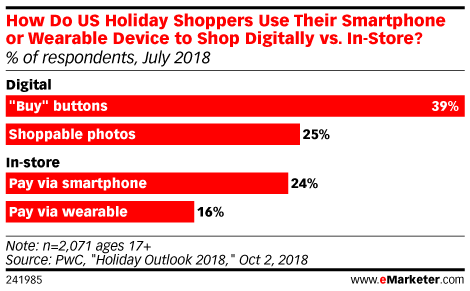 2,372 US internet users ages 17+ who plan to shop for the 2018 holiday season were surveyed online during July 5-26, 2018. The survey respondent population demographically represents that of the US population based on US Census Bureau standards.